What to do if my cat has bad breath? 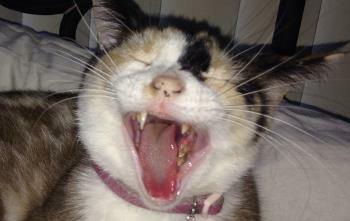 A common complaint by cat owners is their pet’s bad breath. It’s understandable. Our three cats, for example, love to sniff and even lick our faces, and their bad breath sometimes gets in the way of their love (just as worms would). But it’s not only about the love, comfort or hygiene. A cat’s breath can raise a flag for very serious health problems. In this article you will learn about potential causes and treatments of bad breath in cats. 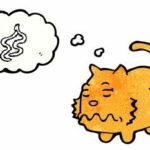 What causes bad breath in cats? Oral and dental problems. 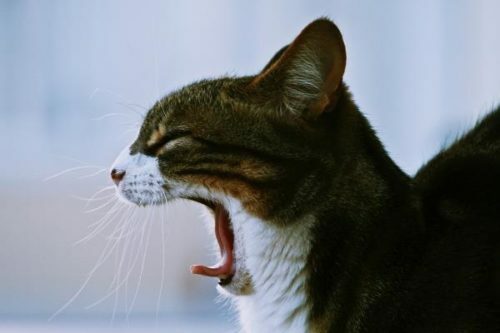 These are the most common reasons for bad breath in cats (just like in people). Bacteria that causes the build up of plaque and tartar release a nasty odor. Additionally, inflammation of gums or other mouth tissues or tooth decay will almost always cause your cat’s breath to be stinky. Non-oral causes. These are less common, though problems in your cat’s stomach or lungs, kidney disease or certain viral infections can cause your cat’s breath go bad. Due to the wide variety of such diseases, we won’t go into much detail here. IMPORTANT: If your cat has bad breath, visit your veterinarian. Trying to remedy it at home may improve your cat’s breath, but it rarely addresses the underlying cause. What other signs should you look for? Tartar buildup on teeth. This can be seen as brownish stuff on your cat’s teeth. Usually the lower part of the back teeth is at the most risk. Redness and swelling of gums. Normally your cat’s gums should be pink, but in the case of dental problems, the line along your cat’s teeth can turn red. This points to inflammation, which, in addition to bad breath, is also likely to cause your cat discomfort and pain. It is also common for gums to bleed. Decreased appetite and changes in eating habits. If your cat’s mouth is in pain, he may be reluctant to eat (or even refuse to eat at all). You may observe this as your cat hesitating to begin eating, eating slowly, trying to chew food on one side of his mouth, or yowling during a meal. Increased salivation. This also points to oral pain. If swallowing saliva is uncomfortable, he will hesitate to do so, resulting in more saliva dripping out of his mouth. This may point to a more serious condition. If you don’t see any of the signs described above, it may be that your cat’s bad breath is caused by something else. You should always seek medical assistance if you observe other symptoms, such as diarrhea, vomiting, or lethargy. These usually point to very serious health conditions. A visit to your veterinarian is necessary in any case. 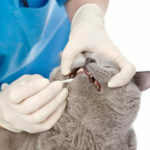 Tartar is a very solid structure, made of tough buildup of hardened plaque on your cat’s teeth. You can’t scratch it off with a toothbrush. Your veterinarian will scrape tartar off your cat’s teeth with a special tool, similar to the way dentists clean our teeth. REMEMBER: The decision of whether or not to clean your cat’s teeth is not about whether cats need it for good dental health. Any creature with teeth will benefit from a toothbrush. It’s more about whether you think your cat is worthy of receiving the same amount of care that you do. It’s okay to say that a cat is just a cat, but don’t hide behind “cats don’t clean their teeth in the wild”. 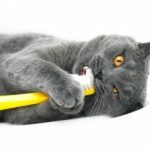 You can learn more about brushing (or not brushing) your cat’s teeth here. Can you remedy your cat’s bad breath at home? There are a wide variety of products available on the market that claim to improve your cat’s breath. The most popular ones are dental treats, dental cat toys and water additives that help to remove some (some, not all) of the plaque off your cat’s teeth and also give a fresh scent to your cat’s breath. Keep in mind, though, that these are not permanent solutions to bad breath. They give a quick patch, whereas addressing the underlying cause is still important. Compare it to having a stinky litter box in the middle of your room. What can you do? The best way to fix it is to scoop it. Alternatively, you could spray an air freshener in the room, and temporarily it would solve the problem. However, if you do not remove the waste from your cat’s litter box, the smell will soon return. It’s similar for your cat’s breath. You should solve the real cause of the bad breath rather than giving a minty chewing gum as an air freshener. As you work through the problem with your veterinarian, you might want to prevent the problem from recurring in the future. Regardless of the underlying problem, follow your veterinarian’s instructions carefully. Because the most common cause of bad breath in cats is dental issues, regularly brushing your cat’s teeth is the most efficient way to prevent halitosis. If you commit, you should brush your cat’s teeth daily, or at least three times a week (it is possible to train a cat to cooperate). Additionally, especially if you think you are not up to task, make sure to regularly bring your cat to your veterinarian for checkups. 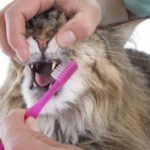 Why is it necessary to brush your cat’s teeth?